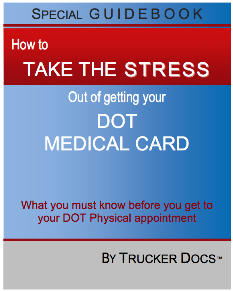 New DOT Physical Requirements, Medical Card – CDL Driver Ripped Off? 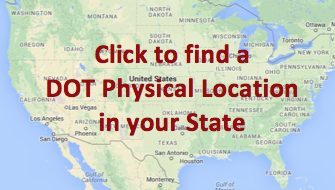 You are here: Home / DOT Medical Card / Invalid DOT Medical Card – CDL Driver Ripped Off? Invalid DOT Medical Card – CDL Driver Ripped Off? The driver, we’ll call him Tom, comes into the office yesterday, really p*ss*d off. He had been trying to get his DOT medical card from his usual doctor. The doctor and his staff had been putting off Tom coming in for his DOT medical exam. The reason was that the doctor was “delayed in getting throughout the FMCSA material modules” and that he was “going to be on the National Registry soon”. When Tom called and pressed for a date to take his DOT physical exam, the staff stated that their doctor was on the NRCME and the driver could get his examination done there. Tom goes into the office for the exam and asks – to verify the doctor is a DOT certified doctor on the NRCME – and is told “yes”. Tom meets the qualifications and passes the DOT physical. He’s relieved that he has a new medical card before the old one expires. Back at the front office, Tom is charged $140.00 for the DOT medical exam and an additional $90.00 for lab work, that according to the doctor is mandatory for the DOT examination. A total of $230.00 for a DOT exam and medical card. Tom questions the additional lab fees stating that it is not a part of the DOT examination and is told by the doctor that it’s a new rule. Tom pays and leaves with his new medical card and paperwork. Tom then goes to the Utah drivers license office to turn in his self certification and a copy of his new medical card. The agent at Utah DPS checks his paperwork and tells Tom that his doctor is not listed on the FMCSA National Registry (NRCME) – That his medical is of no use to them! Tom may have QUALIFIED for a DOT Medical Card, but the card he has in hand is NOT VALID! Now Tom is really peeved. Here is a driver who has been diddled around, overcharged, and has nothing that he can use to continue to drive. Tom calls a buddy to ask where to go to get a valid medical card, and he ends up here at Chiro Stop. So, Tom walks into our office, really p*ss*d but very pleasant . His story takes a while to tell, but within 30 minutes he’s qualified – passed his DOT physical. He saves time because our office faxes all his paperwork to Utah DPS. We fax medical certification information routinely to Utah DPS, and they’re very helpful and efficient. If there is any question, they contact us immediately. We laminate a wallet medical card for Tom, give him copies of the medical examiner’s certificate and long form. Only $80 for everything. Tom walks out of our office a happy camper, valid medical card in hand, ready to head on down the road. As of May 21, 2014, interstate CMV drivers are required to obtain physical examinations and a medical examiner’s certificate from a certified medical examiner listed on the National Registry. Even if the doctor is in the process of getting certified, but not yet listed, the DOT physical and card will be invalid. Any mistakes written on the medical examiner’s certificate will invalidate the medical card. Be sure to check the DOT physical cost up front. Some DOT physical locations charge an additional fee for the urinalysis, which is a simple but required test to check for medical problems indicated by the kidneys. There are other pitfalls too – such as the big issue with sleep apnea screening – that a commercial driver renewing or getting a new DOT medical card, may not be aware of. What is the cost to you of an invalid medical card? It pays to do your homework before you go for your next DOT physical exam. Ask other drivers about their experience and recommendations for a DOT physical location. You don’t need to be ripped off on costs, hidden fees, and unnecessary add-on tests. But… “too much to pay” may be about more than just about dollars out of your pocket. Looking for the cheapest DOT physical location may not serve you either if you can’t make an appointment, you’re kept waiting in line for hours, or you’re screened inappropriately for additional tests. What is your time worth to you? With a little inquiry you can find an affordable and convenient DOT physical doctor, and get your medical card the same day. Any clue when the FMCSA site will be back online so that we can upload the completed DOT exams? Well it’s been down for a while, so your guess is as good as any ones. Your medication implies that you are an insulin dependent diabetic. Your doctor would need to have more information before starting an examination. Must be some weird company policy. Otherwise we would just be guessing as to why they have made such a request. We have a driver who has been issued 3 month certificates by separate examiners. He is supposed to get a sleep study and/or stress test completed but just continues to get 3 month cards from different doctors. What are the rules concerning 3 month certificates? My understanding is that a 3 month certificate can only be issued once for a specific problem. He should be disqualified until he completes the required test. He is now a possible safety issue. One three month card to get his stuff together, that’s it. FMCSA will ultimately catch up to this, but like all government offices, they are overwhelmed and understaffed. Excellent commentary ! I learned a lot from the specifics – Does someone know if I could access a fillable VA 22-5495 example to complete ? My brother in law got his cdl in PA so he could get a job as a mechanic for USPS. He checked off the wrong type of issuance needed. He is in state and a mechanic as a federal employee. He did not need a medical card, but due to his error, has one. He failed the breathing test just yesterday and is not sure what to do. Can he change the status so he is exempt from carrying the medical card? He never drives rigs, just light maintenance and welding. Most driving and maintenance is done on the small carriers. He should be able to change his status. Check with the state DLD and confirm that he does not need a medical card first. Most vehicles that are being used for commerce need a valid medical card, but not necessarily a cdl. It sounds like he just needs something to operate as an intra-state only driver. Concentra issued a 30 day card after receiving 30 day cpap report instead of a one year card and will only issue me a 30 day card only after receiving a 30 day report for a year.They are not treating me for sleep apnea.Only went there because new company sent me there for a med card.Can they do that.Can i go to another cme? Not sure what else is going on here. Once you demonstrate proper usage of the cpap, the examiner has to make a judgement call as to how long he feels comfortable to extend your medical card for. But every thirty days for the next year sounds a little extreme, but it is up to the examiner. I live Virginia and have a CDL-A lic for 25 years.Not employed with any trucking at the moment. But need to update my DOT Physical Card. I whet to the same medical clinic I had my last physical done. Same Doctor,I have checked to see if his name is registered with the NRCME. I found only two in the state of Virginia,and he was not one of them. Now would this make my medical card invalid? So far from what I have read at this time he is not a viled CME. Paid for the physical before seeing or taking any part of the physical. After going through all phases of exam. Then I was told I had to get a sleep apnea test done. Yes my neck is about 18 inches and I may have a few extra pounds. (260lbs) For years I run 5 to 10 miles a day and lifted weights. I am 63 years old, When l retired from the military 25 plus years ago I weighted. (260 lbs) After all said and done he said I was in good shape. I just want to say ,I truck because I like it . So all you TRUCKER and TRUCKING MAMA be safe out there and keep it between the lines ..
My husband went for his dot exam with his companies specific doctor. The Dr told him that he was obese and needed to have a sleep study and gave him a 30 day card. My husband had a home study because his company gave him a shorter time to comply. The home test was not totally conclusive and they suggested an in lab test. My husband explained the time crunch so they told him they would go ahead with cpap. My husband’s family doc told him to get a second opinion with another cme…..so he did. The second Dr weighed him 20lbs lighter, neck size 1 1/2 inches less and 5 points off bmi. Checked prelim sleep test and said it was garbly gook. Gave him a 30 day card to get everything figured out. Company will not accept it and will only go by THEIR company Dr.s findings. We will find out tomorrow if my husband will still have a job. Any suggestions as to what we should do??? Anyone we can call to officially complain. This is thoroughly rediculous. The company will not accept another cme opinion. PLEASE help!! Well the first issue is that the company has a policy and you can’t really bypass the policy. The second issue is two very short term cards with a test result that does not help at all. What really needs to happen is that doctor number one needed to give the driver the opportunity to get a sleep study done. Maybe a three month card. That would have allowed you time to set appointments and get the test results back. As far as who to report this to, you might try FMCSA, but not sure they can help because this is a company policy. FMCSA should tell you that the driver has the right to go to any CME he wants, after 30 days if he needs to. You may just be between a rock and a hard place at this point. I am actually a certified examiner. Recently had two men with insulin dependent diabetes, we started the process for Diabetes waiver, sent them to endocrine doctor, who eventually returned them to me stating that they could get Intrastate waiver instead. 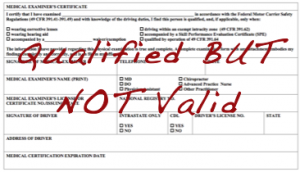 So I am verifying – for intrastate CDL, no need for certified examiner to see them at all? they can go wherever? I do not need to enter this on FMSCA website? I have questioned everyone about this and cannot get clear answer! It’s a great question. Like you, I have hunted for the answer and not found one. So here is my take on this issue. Since the CME is more acutely aware of the duties and jobs that a commercial motor vehicle driver must perform, then I still want to be the one who makes the final decision regarding the driver’s capabilities. I get the feedback and information from the primary doctors and with that information in hand I can make a better choice as to the driver’s weaknesses and strengths. I can also make sure that the medical card is filled out correctly and with a proper time limit, based on the examination findings and medical reports. If it is a class B or class A commercial drivers license, I do put it into the FMCSA database and also help the drivers with their self-certification forms. With all this I feel that the driver and the public at large are as safe as possible rather than letting an examiner, who does not know what a driver does for a living, have the final say in this matter. Hope this helps. I had slightly high blood pressure when inwent to my dr. This summer. She gave me some meds for control. I went to get a dot physical. We didnt talk about my blood pressure and I paid the outrageous cost of $76.00. After returning to my showup and giving the card to my boss for a copy, I noticed it was only for a year. I called cacentra and was told dot regulations said if someone takes pills for high blood pressure, they were only to get a med card for one year. I asked what the regulation number was that says that. They didnt know. The next day they said the dr. Would call. He refused. I called the dot in Washington and was told it didnt say that. I called the kansas dot field office. The lady told me they want to make sure im ok. REALLY? He never even ask me about it. She said he explained why its only a year. NOPE, never said anything. I am fit, not over weight at all. The regulations state: if a driver has no clinical diagnosis of high blood pressure likey to interfere with his ability to operate a commercial motor vehicle safely. It is also my findings that Concentre is the ONLY One showing up thats qualified to do these dot med cards. Hum…. something is very wrong with this. I will keep looking for a way to fix this problem. You may want read further. Any individual who is controlling their high blood pressure with medications is given a one year medical card. The purpose, according to the FMCSA, is that all doctors involved with the driver are keeping an eye on the driver’s health condition. One year is standard for this situation. That being said, the DOT examiner should have had a discussion with you regarding this, and he should also have asked for a medical release form to be completed by your primary doctor. My father who has had a CDL for over forty years of his life has just been rejected to renew because he has a defibrillator that was installed several years ago. He did not have a heart attack prior to the installation nor has he had any cardiac issues since then. (He was diagnosed with a congestive heart issue after receiving chemo years ago.) His cardiac specialist, upon hearing that he had been declined for CDL, has sent us a letter stating that my father is “…stable from a cardiac standpoint and is clear and safe to operate a commercial vehicle.” I want to make clear that he is not an over-the-road truck driver driving big rigs for long hours, but operates a small town rental store and is only interested in hauling small equipment every now and then when an employee is unavailable. The medical examiner that denied his first attempt at obtaining his medical card has been extremely rude throughout the ordeal and we are in hopes that it would be possible to see a different examiner without it appearing that we are trying to “sneak” through the process. My questions are these: can he see a different medical examiner without penalty/appearing dishonest? although he has a defibrillator, with his cardiac doctor not opposing him obtaining his CDL, will his written opinion be validated and taken under consideration? This is his livlihood and I want to be well prepared for whatever it takes to try and make sure he can continue to do what he loves to do (& what he is CAPABLE of doing). Thank you for your time! If your dad is trying to maintain a Class A drivers license, then the CME is correct. If your dad wants to drive a smaller vehicle, like 10,001 pounds or less, and is willing to downgrade his license to a lesser class, then these rules may not apply and he may be able to continue driving. Also the note from the cardiologist is fine and dandy, but he is not the DOT’s CME and is not presently (according to the FMCSA) qualified to make this decision. If you wait thirty days and downgrade to a lesser license then you are within your rights to go to another DOT examiner. But a defibrillator, according to the FMCSA’s regulation/law is not going to pass with any CME.